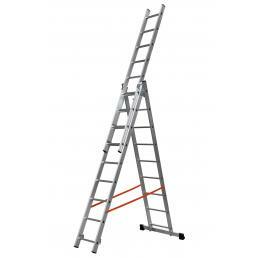 In the Mister Worker™ catalog there are several models of Gierre transformable ladders, ideal for those who have to work at different heights and needs to always have a versatile and safe aluminum ladder. All Gierre transformable ladders are professional aluminum ladders that can be used in different positions and to reach different heights: they are perhaps the most versatile staircases on the market, and are perfectly suited to be used in a large number of environments. Among the most sold are the double convertible stairs, suitable for reaching heights of up to 7 meters and ideal for both professional jobs and home improvement activities. These are robust and stable Gierre staircases, which can be used in different ways: all of them are extensive or have a wallet, depending on whether or not a support wall is present. The rubber feet are of high quality and guarantee maximum stability in every situation. 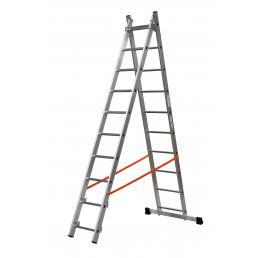 The transformable triple ladders, on the other hand, are the top of the range and ensure high performance in the field. 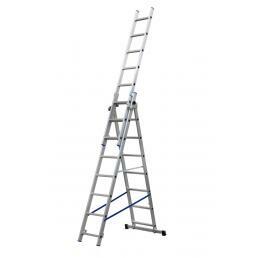 The Gierre PRO ALSS triple transformable ladder has a supporting trunk with a flared base, which allows a high stability even without a stabilizer bar, and its structure is in electro-welded aluminum, a safe and innovative material. It can be used completely extended, double, lame or cantilever, based on the needs of the moment, and has practical anti-opening ropes and an anti-lock safety bar. All the scales on the Mister Worker™ website are of high quality, suitable for all types of use and, above all, certified EN 131 according to European safety standards.